It is late afternoon on Friday 29th June 2012 and Jim is heading to the ferry from Ardrossan to Brodick to enjoy a couple of days on the wonderful Island of Arran and to be at the Arran Malt and Music Festival. Jim and Jacqueline, while waiting for the ferry, were a little worried because the wind was howling and the rain was torrential (another typical Scottish summers day) and we wondered what awaited us on the Saturday at the Arran Festival, the weather forecast was certainly not favourable, albeit it was not our first visit to this distillery, it was our first to the Festival and we had no intention of missing it. Ferry trip over we headed to the beautiful Lochranza and arrived at our hotel, The Lochranza Hotel which is only one mile from the distillery, our room was more than adequate, but the selection of malts in the bar was totally outstanding, as was the food and the bar staff made us very welcome. Slowly but surely some of the distillery staff and helpers arrived after a hard days preparation at the distillery and Faye Black, Mark Connelly and Euan Mitchell joined us. The Festival pre party had started and we had a great wee chat, some fantastic single malts and the true “spirit” of Arran began to flow. On Saturday morning we had a hearty breakfast and a delightful walk along the shoreline. After enjoying the sea breeze we were now ready to go along to the distillery for a taste of Arran and to meet some old friends and hopefully to meet some new ones. Due to the weather over the past few days some of the marquees could not be raised and many of the events were transferred into the new warehouse no. 3, but like most seasoned Whisky lovers adapting to the weather is never a problem. The weather turned out not to be as bad as forecast, mid afternoon there was a little rain but other than that is was overcast but dry. Faye Black the Visitor Centre Manager and Brand Ambassador was buzzing about like the queen bee as she made sure that all the events were going as planned and at the right time. 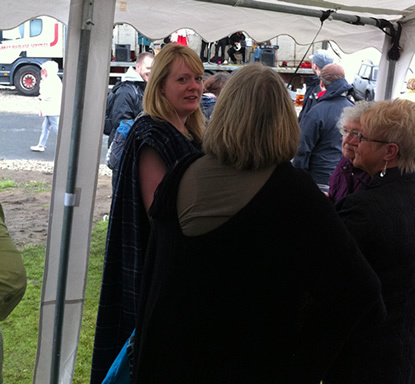 The food marquee was busy with a good selection of food available, from burgers to soup and salads and some delicious pulled pork. The day was filled with many Whisky tasting events and one or two Master Classes held by Euan Mitchell (Managing Director) and James MacTaggart (Distillery Manager). The busiest marquee of all was the Malt Whisky/Cocktail/Ale marquee where many fantastic Arran drams were being served to the very appreciating crowd. The highlight of the music was Robin Laing who gave some humorous Whisky renditions, which the crowd laughed and really enjoyed. So many highlights, another one was to see the Golden Eagles soaring high over the Distillery and the surrounding mountains. 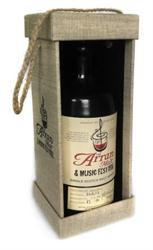 Jim’s favourite dram of the day was The Arran Single Malt Amarone Finish, which was full of dark chocolate and stewed fruits. 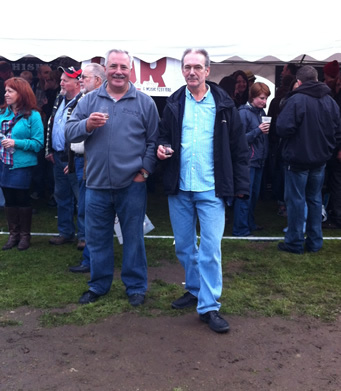 Jim also tasted the Festival Bottling which was as grand to drink as it’s fantastic packaging. After tasting the new expression, The Devil’s Punch Bowl, Jim had to buy a bottle. This is a festival that is hard to put into words, so much was happening and the choice of drams was spectacular the staff and the organisation was first class. There was a real sense of family and visitors were made very welcome. There was a real buzz in the Visitor Centre Shop where the Festival Bottle and The Devil’s Punch Bowl were flying off the shelves. It is not a surprise that this distillery was our Distillery of the Year 2011. To finalise our fantastic day we were welcomed onto the staff bus to go and see the Proclaimers at night which was wonderful. Without a doubt the Whisky Boys would walk 500 miles to enjoy a wee Arran single malt. Sounds like a great time, sorry to have missed it! How was The Devil’s Punch Bowl?